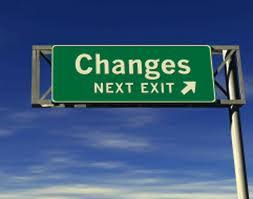 Over the past few weeks I have been very busy rethinking how I run my writing life. 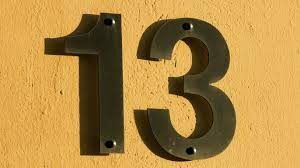 I have been working as a professional author for 13 years this month- unlucky for some perhaps. 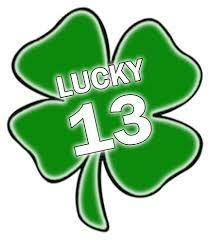 I will be honest- it has felt pretty unlucky at times this year. A great many changes have assailed me over recent months, and it has taken some serious thought as to how to keep going – or even if I should keep going. However, thanks to my family, my incredible friends, a great deal of writerly advice, and an amazing weekend at the Scotswrite17 conference in Glasgow, I can now see a way forward- and normal service will be resumed very soon. When I say normal service, what I actually mean is normal-ish. I have decided that I will no longer be working 14 hour days , with only 10 days holiday a year, and only weekend mornings off work during the week. No more than 10 hours a day will be worked from now on (yes- I know- that won’t always happen- but my intentions are good), no work on a Saturday, and I will take at least 2 weeks off a yr. Luxury!!! I need to take more walks- have more adventures- see more people- and as a result- I will have more stories to write about later. As many of you know, I have recently started a new business with my lovely friend Alison Knight – this being an entrepreneur type is hard work, but very rewarding. 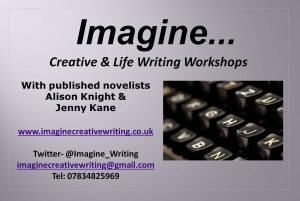 Our creative writing workshop business, Imagine, has taken off in ways we never imagined (pun intended!) I never dreamt I’d be teaching dementia sufferers how to write stories- nor that I’d have to turn people away from my classes because the tickets were sold out and there was no more room to sit. I feel honoured to say the least. This change of focus, away from writing 3 novels a year, down to writing one and a half novels and teaching, has done me a lot of good already. And that is just the start of the changes afoot. Those of you who have kindly been following my work for some years, will know that my career began at Kay Jaybee (over 18’s erotica). For the time being, Kay Jaybee is having a writing break. All her old work is being re-edited, revamped and- over the next two years- will reappear looking all lovely and shiny, ready for a brand new readership. My Jennifer Ash side meanwhile, is beginning to gather pace. I am currently awaiting the republication of The Outlaw’s Ransom– and the brand new publication of The Winter Outlaw– watch this space…At the moment neither volume is available- but it won’t be long until they are. I am also doing some other work as Jennifer…but for now my lips are sealed on that..
All these teasers…So what can I tell you? Well..Imagine is proud to present its first writing retreat! 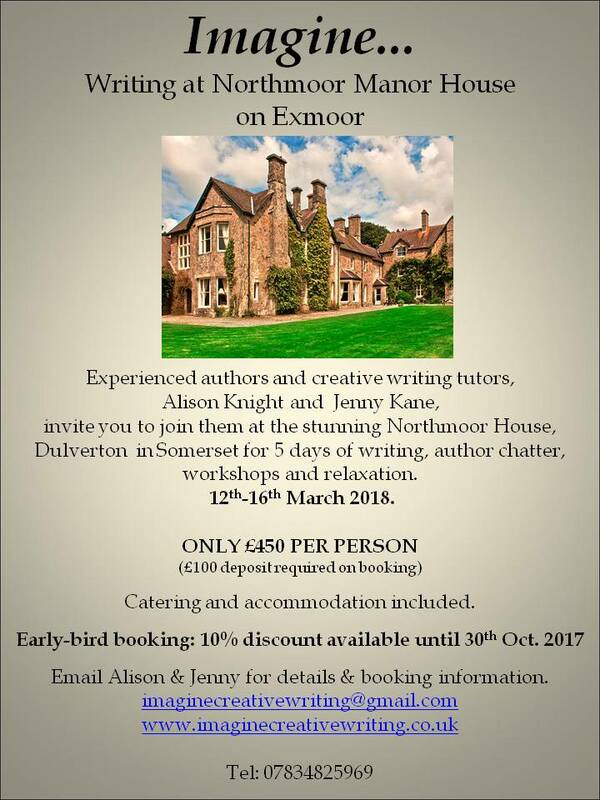 Fancy escaping onto Exmoor next March to write, dream, chat writing, maybe take a class or two, and meet guest speaker, Kate Griffin (writer of brilliant Victorian crime mysteries for Faber Faber), and generally enjoy chill out time? Then book your place soon to take advantage of our 10% off Early bird discount! I have been lucky enough to become a member of the Exeter Author Association- and so far I’ve had many adventures! Today’s author photo shoot was so much fun- I’m still giggling. I was balanced on a very precarious bridge for some time…just prior to hugging a very lichen cover tree…photos soon! The next Exeter Author Event is the Bampton Charter festival on 26th October – Bampton, Devon. Do come along and see us selling our books, reading, running mini workshops, and generally making folk smile. Having listed all that – and forgive the indulgence- it has helped me get things straight in my own head- I’d better go and get on with it all. I’ve only worked 9 hours today , so not breaking my own rules just yet!